Dakshina Kannada District Court Process Server Jobs: 26 Process Server Posts are released by Dakshina Kannada District Court, on 01-02-2019. Candidates who are having 10th class qualification they are only eligible to submission of application form online for this DK District Court recruitment. 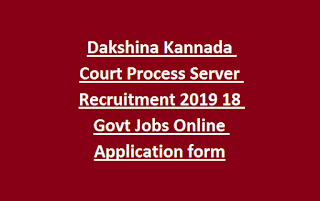 Last date to apply online for this Dakshina Kannada Court recruitment is 28-02-2019. Candidates selection is based on written exam only for this Process Server Posts. Candidates will be shortlisted on basis written exam marks and /or interview marks. If less applications are received then only interview will be conducted. Exam date or interview dates will be displayed in Dakshina Kannada District Court official website of https://districts.ecourts.gov.in/dakshinakannada. Apply online for this Process Server posts through DK District Court official website. 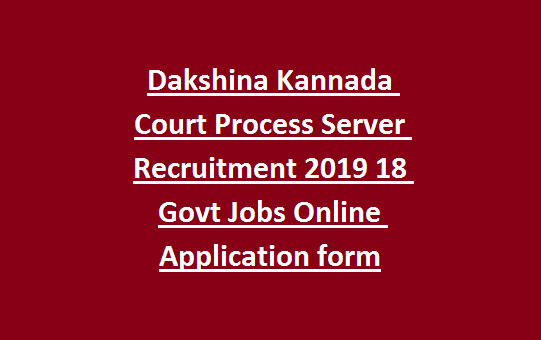 Qualification, pay scale, online application form and other details about this Dakshina Kannada Court Process Server recruitment is updated below. There are total 26 poss are in this Dakshina Kannada District Court, recruitment 2019. Upper age limit for Process Server Posts is 35 years. For SC/ST/Cat 1-38 years, Cat 2, Cat 3-40 years. 10th Passed candidates are eligible to apply online for this Dakshina Kannada District Court Process Server Posts. Shortlisted candidates will be called for interview or written exam. Candidates have to apply online for this Dakshina Kannada District Court recruitment on or before 28-02-2019. Official website to apply online is https://districts.ecourts.gov.in/dakshinakannada.